Will Trump’s US-Mexico border wall get built and why did he declare a national emergency? DONALD Trump shut down the US government for 35 days after Democrats refuse to fund his border wall. Now his national emergency order to release military funds has run into a legal block. Here's the latest. Why did Donald Trump shut down the US Government? Donald Trump vowed to shut down the government in a fiery Oval Office meeting with Democrat leaders Chuck Schumer and Nancy Pelosi. They were refusing to bow to his demands for $5.7billion to build a 200-mile barrier. The shutdown began on December 22, 2018, and lasted a record 35 days until January 25, 2019. Mr Trump threatened a second shutdown which was averted with a deal between Democrats and Republicans to provide just over $1bn for the wall. The president still insists the wall is needed to stop illegal immigration and drug trafficking. Why did Donald Trump declare a national emergency? On Februaqry 15, the president went through with his earlier threat to invoke a national emergency by presidential order. That gives … [Read more...] about Will Trump’s US-Mexico border wall get built and why did he declare a national emergency? Will Donald Trump’s US-Mexico border wall get build and when will the US Government shutdown end? DONALD Trump shut down the US government for 35 days because Democrats refuse to fund his border wall. Here we reveal what he said, what the wall will look like, and how much it cost. Why did Donald Trump shut down the US Government over the Mexico border wall? 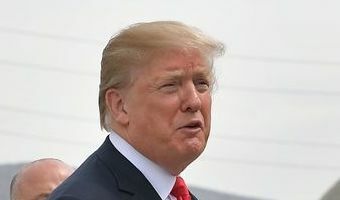 Donald Trump vowed to shut down the government over the wall in a fiery Oval Office meeting with Democrat leaders Chuck Schumer and Nancy Pelosi. The President promised he would allow a partial shutdown of the federal government if Congress does not provide £3.95billion ($5billion) to build the wall. Senior White House adviser Stephen Miller has called it a "fundamental issue". When asked if the administration was willing to allow parts of the government to cease operation at midnight on Friday, December 21, if the wall was not funded, Miller answered: "If it comes to it, absolutely." The shut down began on December 22, 2018. Democrats, who will take over the House of Representatives in January, and some fellow Republicans … [Read more...] about Will Donald Trump’s US-Mexico border wall get build and when will the US Government shutdown end?